Lithium niobate is a widely used ferroelectric material with several interesting optical properties, however, it is prone to defect sites in the crystal which can lead to optical damage. 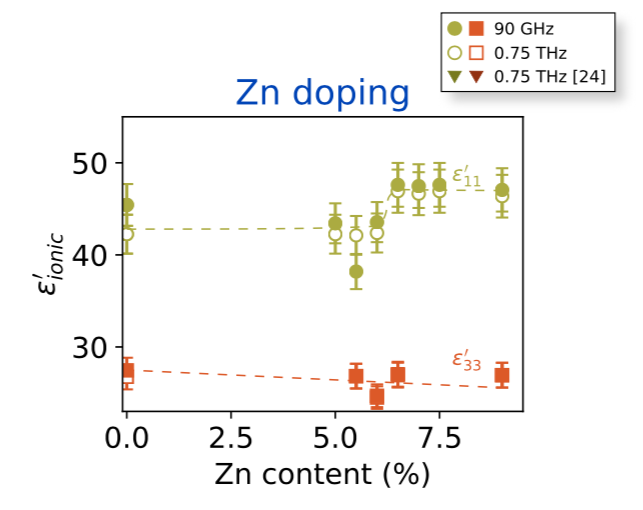 To circumvent this, dopants can be incorporated into the crystal in a controlled manner, and in this work in collaboration with the Luxembourg Institute of Technology, we combine terahertz spectroscopy measurements with Raman studies to extract the effects of dopants on the optical properties over a broadband range. The work concludes that the two most commonly used dopants possess different incorporation mechanisms into the crystal structure. Next: Next post: Congratulations to Ben Lont!